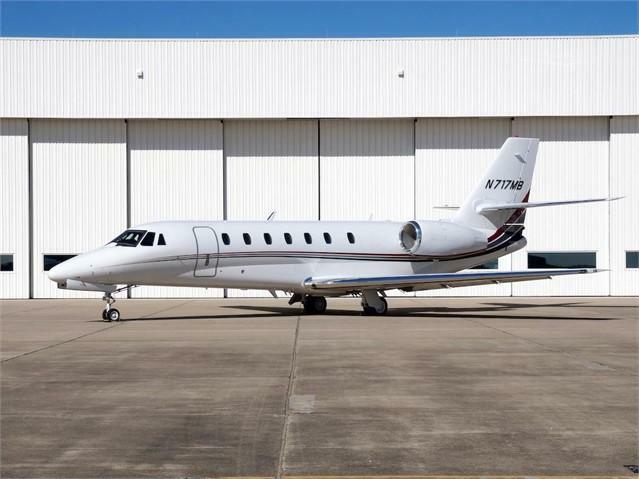 2006 Citation Sovereign - 2,945 TT, 2,945/2,945 SOH (Will be delivered with Fresh HOTS), Honeywell EPIC, EPIC Phase 5.2 software, ADS-B(out), Dual HF, Extended Range Oxygen, FMS Performance Database, plus more!!! New to market, call for details. Nine passenger seats (eight double club and one forward side facing seat), RH forward refreshment center, LH forward coat closet, four executive tables, aft lavatory with vanity and storage compartments. Forward and aft baggage storage closets, heated baggage compartment in tailcone, auto window shades, fire blocking on all passenger seats, dual disk DVD player, Airshow 410, drop down 17” overhead monitor in forward cabin, video monitors on window reveals at seats #3, 6, 7 & 10. Overall White with Ruby Red Metallic, Black Velvet, and Medium Silver accents.